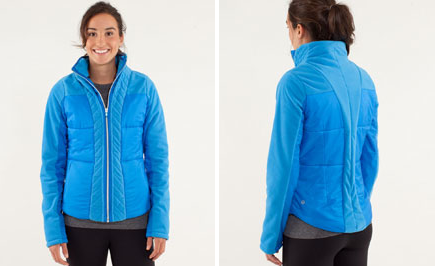 New St. Moritz Jacket (St. Moritz, Switzerland in case you where wondering)which is made with Polyester fill for those of you that are allergic to down, or dislike the fact that Lululemon is unclear about wether or not their down is ethically sourced (live plucked vs. by-product of food industry. Lululemon says they do not use ‘live plucked’ but will not provide information supporting their claim). "Lululemon Settles Patent Litigation With Calvin Klein"
"New Devotion Tee LS’s! Black Swan and Heathered Limitless Blue"